I was recently tagged by the lovely Sarah to do this tag which looks pretty good to me so here we go! I really have absolutely no idea! I can't remember how I even discovered that blogging existed. I've been reading blogs for over 3 years and my memory is definitely not that good. My favourite blogs to read are EmTalks, Through Chelseas Eyes, CoutureGirl, Victorias Vintage and of course the lovely Zoella. There are probably more but it's so hard to think off the top of your head! I've never been able to attend loads of meet ups, only the one, so I've not made any blogging best friends, boo! But I have kept in contact with Jordana since we met at the Winter Wonderland meet up (we're planning a YouTube collab ;)). I've also had a good few chats with Sarah and we bumped into each other in our local Boots not so long ago! We're planning to meet up soon which should be fun! I really want to make some good friends through blogging so I'm hoping to attend more meet ups this year. Speaking of which, anyone going to #LWParty on Tuesday? Name a blog that enables your purchases? Now this question confuses me, does it confuse anyone else?! However going by other bloggers answers, I'm thinking it means a blog which makes me buy things? If that's the case, then I'm not sure I have one particular blog that does that! I just get tempted to buy things when I see lots of people reviewing it in a good light. 5 blogs that everyone should be following? Your favourite way to read blogs? 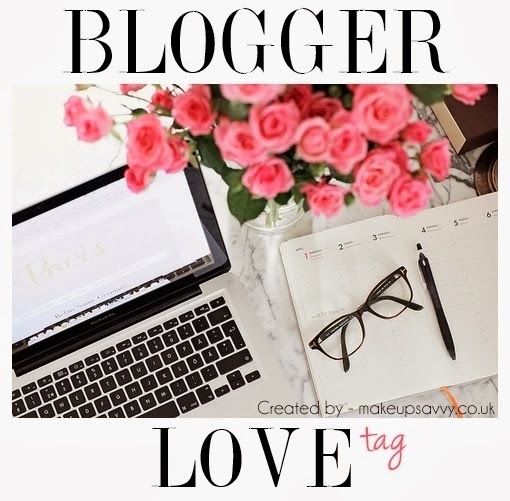 I think I still prefer blogger to Bloglovin! I follow more blogs on Bloglovin in case GFC leaves us and I do still read blogs on there, but I prefer good old blogger! I'd say EmTalks, you can tell she puts a lot of time and effort into her posts and really tries her best to make them great! I feel like she is a very ambitious, hard working person! Becca Rose, her blog design is really simple but doesn't look overly professional (if that makes sense!) and just looks kind of fresh and I really like it! One of my favourite things about blogging is the #bbloggers chats on twitter! I always look forward to Wednesday and Sunday evenings and really enjoy having a good old chat with loads of bloggers! Hope you enjoyed this tag and let me know if you do it too! This is such a fun tag! Great post!